I know, I know. We are awesome kids. That is what the room looked like the day before Quinn's 1st birthday party. We did manage to clean it up quite a bit, but it still looked awful. Since this room is all by itself downstairs, with a separate entrance to the outside we thought it would be perfect for her and her two pooches. It also has a huge walk in closet and a bathroom (which we also have to redo) right next to it. 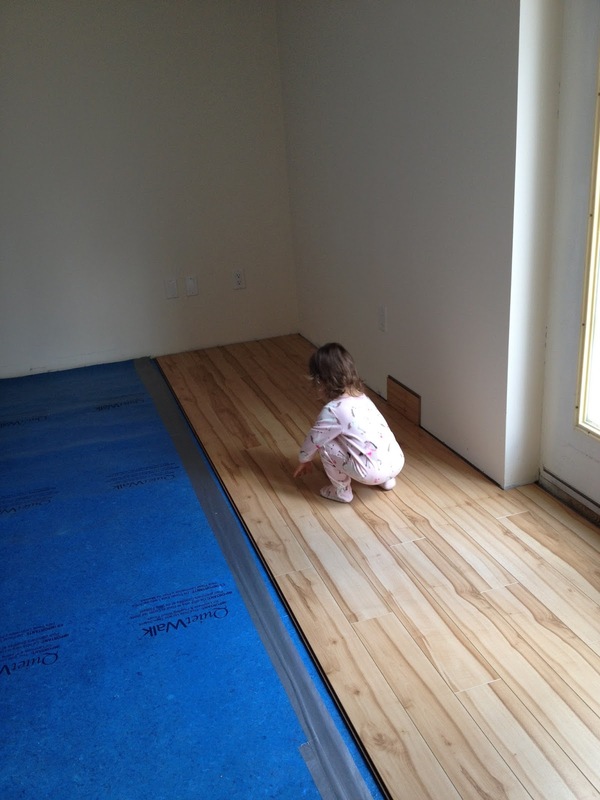 We started with flooring, well because flooring is always fun. I didn't care about it really, all I knew was that I wanted something sturdy and easy to clean. Unlike our insanely expensive wood flooring upstairs which dents when you drop a Hershey Kiss. Not really, but I hate it and it's full of dents thanks to a destructive toddler and crazy dog. Anth went to our favorite flooring warehouse and came back with what looked like hard wood flooring, but was actually laminate. I am so in love with it, I wish we would have done our entire house with it! And it was pretty easy to put together. Quinn obviously was a huge help. Then some new french doors and that should do it! I figured whenever my mom does move out it can be Quinny's playroom, so it's a win win! And it adds a 5th bedroom to the house for when we sell it. Which I hope is sometime in the next year or two. So let's hope this goes smoothly and we can get it done sooner rather than later! crap! DH is signed in, this is Shannon, Baby Shmizz! Looking great! Can't wait to see the finished product!